In my last post I presented the method I was going to use each week to select my letter of the alphabet and I did as I said. And the winner is -insert drum roll here –R! The same as Laura’s. How much of a coincidence is that! So, here I am and the first thought that comes to my mind: R U stuck? Yeah. What am I going to wRite? So, heRe I sit, staRing into the monitoR, typing these woRds, capitalizing all the “Rs” and thinking, this is silly. Yeah, I’ll abandon that. So, onto my next jump starter: my R list. 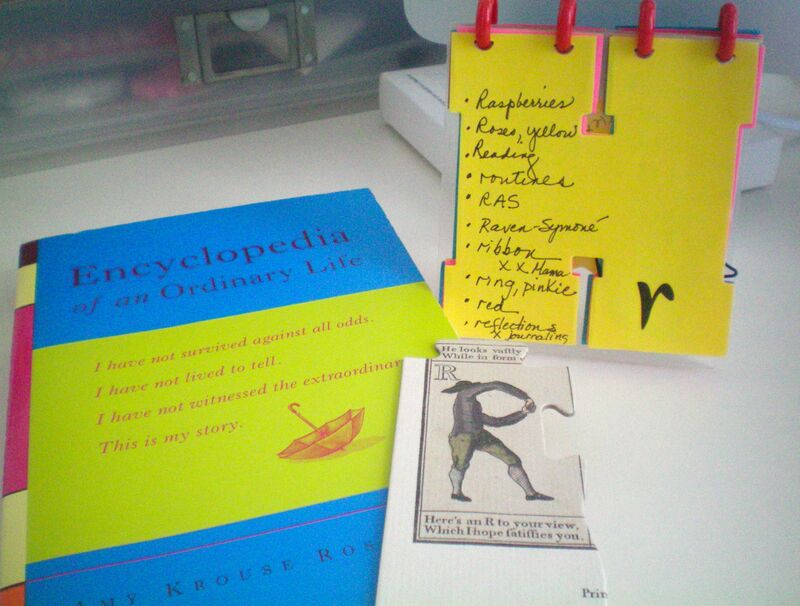 About 6-7 years ago, friend Kathy and I took a scrapbooking class that had us create an album based on the book Encyclopedia of an Ordinary Life by Amy Krouse Rosenthal. For each letter of the alphabet, we brainstormed a list of words that were descriptive of ourselves and/or resonated with us and found a photo that reflected that letter or a word on the list. raspberries – I don’t know when or why, but sometime in 2005-2006, I developed a love affair with the raspberry: fresh, frozen, jam, syrup, you name it. roses – especially if they are yellow. reading – a staple in/of my life. I have fond memories of reading as a child and I have always had several books “in process.” My mother was an inveterate reader and so are my sister and I.
reflection – I think this is a most critical aspect of learning…and life. Especially my own. routines – Last night, I decided that today I was going to make a minor change in my morning routine. Instead of going downstairs for MSQT, I’d fix my tray and bring it upstairs and write this post. So, here I am, at 8:05 am, EST, and about to wRap (oops!) up this post. 30 Aug	This entry was written by Honoré and published on August 30, 2012 at 9:08 am. It’s filed under Honoré, Lifeology and tagged encyclopedia of an ordinary life. Bookmark the permalink. Follow any comments here with the RSS feed for this post. LOVE your R list! And the H notepad! Thx for Amy’s book title—I’ve requested my local library order it.